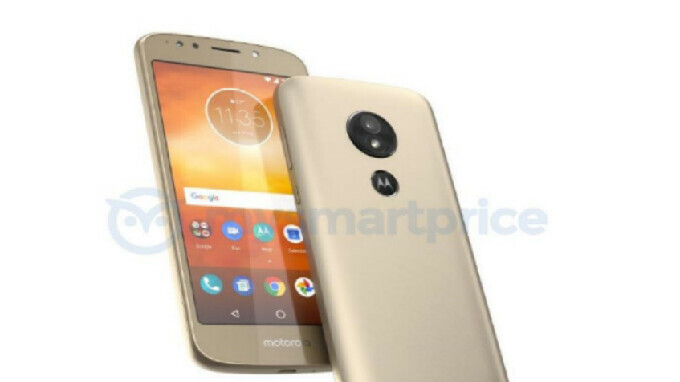 Just yesterday we showed you a 3D render of what was alleged to be the Moto E5. Sporting a real-facing fingerprint scanner (which includes the company's iconic batwings logo), the handset is expected to feature a 5-inch display and a MediaTek SoC under the hood. Today, the Moto E5 resurfaces along with the Moto E5 Plus as both phones are said to be listed on the FCC website. 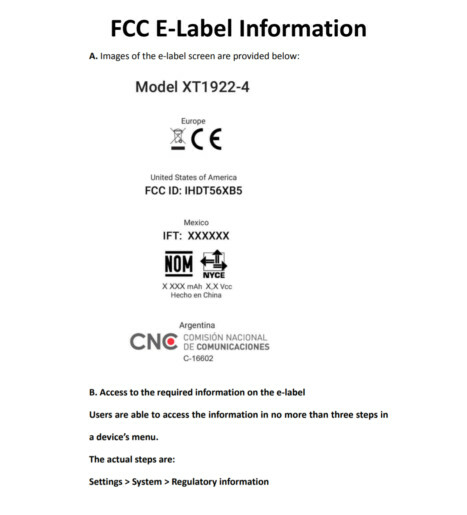 The model numbers posted on the FCC page are XT1922-4 and XT1922-5. While the FCC documentation doesn't give away much information about specs, it does show that both phones will be powered by a 4000mAh battery. Last year's Moto E4 was equipped with a 2800mAh battery, and a massive 5000mAh cell kept the lights on for users of the E4 Plus. The Moto E5 and Moto E5 Plus are expected to be unveiled on April 3rd. With the rear fingerprint scanner, the front home button is gone as is the Moto branding. The latter is replaced by the Motorola name, which is something that we have been expecting to see. We won't find many other changes on the E5 and E5 Plus. Unlike some of the upcoming Motorola phones planned for 2018, these two models will not come with a edge-to-edge screen and the aspect ratio will remain at 16:9. Both devices will employ a microUSB port instead of the Type-C port that most new models are using these days. Such massive bezels, but still with the FPS at the back? How disappointing for me. You do realize that this smartphone is less than $150, right. The E5 plus has a larger 5.7" display with a 2:1 ratio. The resolution is (1440x720). That is a higher resolution then an iPhone 8 (1334x750). Which costs 5 times as much as an iPhone 8. You do realise that the E4 Plus has an FPS on the front, right? And you do realise that the E5 Plus hasn’t been released (so those 2:1 display is only in rumors), and even then, placing an FPS on the front doesn’t require much, right?? I think not. Currently having a new phone that has a fingerprint sensor on the back right under the camera and flash, I have to say I agree. Having to search around the back of the phone for the rear fingerprint reader is annoying to me, so much so that I didn't bother to activate the fingerprint reader. Most of the time I don't find it until I have already smudged the camera lens, and my fingers are too short to stretch the whole way from the bottom of the phone, so I have to re-adjust my grip on the phone to reach it. It is still the power/screen lock button, too, so I still have to reach around for it if I don't remember to use LG's knock code. I much preferred the front-facing fingerprint sensor arrangement of the Moto E4 and E4 Plus, so the Moto E5 is a bit disappointing, especially when they still have the bezel space that they could have put it on the front. Also, the step down from a Snapdragon 425 to a MediaTek chip is unfortunate, though they are both made by TSMC these days. I hope it is at least a 64-bit MediaTek SoC, and not 32-bit. Explain that to Sgodsell of post no.4. You make very valid points. Plz, XT1922-4 and XT1922-5 are the device. "4" and "5" just number of country. Even the G5S Plus doesn’t have USB-C and that costs twice as much as the E4 Plus. Mediatek processor and no USB type C though is a deal killer. That means Android P will not get it. Big batteries are the ways to go!